A pen and ink and wash drawing of the façade of the church of the Redentore (Redeemer) on the island of Giudecca in Venice, and a plan below. Inscribed above in pencil: La Faciata del Redentore a Venezia. With a black ink line border. The church of the Redentore was designed by Andrea Palladio and is an icon of Venetian architecture. The votive church was built on the island of the Giudecca in gratitude for the deliverance of Venice from the plague which had struck in 1575. The main pediment of the façade crowns a series of smaller interlocking ones in the tightly symmetrical design. Palladian architecture was much admired by Joseph Smith, Antonio Visentini and others in the eighteenth century who promoted a revival of the architect's classical principles. From about 1740, Visentini began making sets of architectural plans and elevations documenting the best classical buildings and Renaissance churches in Venice and beyond. 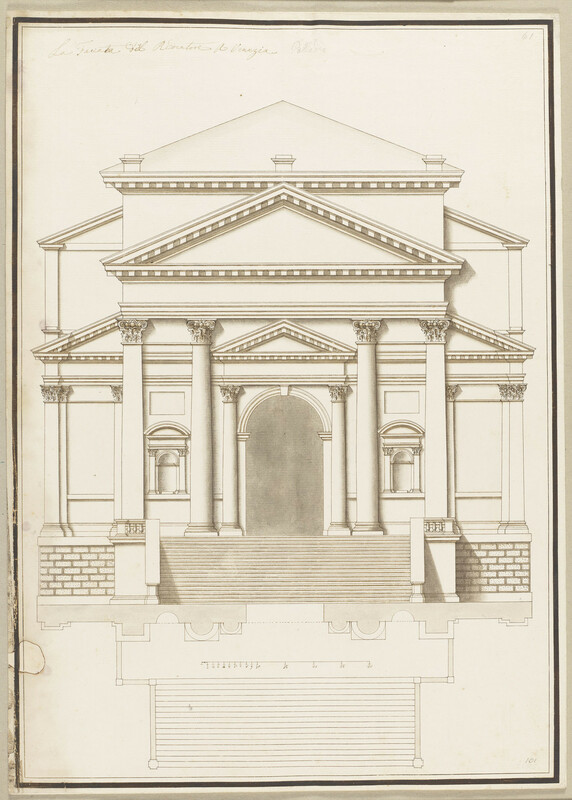 These drawings were part of Smith and Visentini’s efforts to disseminate knowledge of important Palladian buildings in Italy. The drawing is one of some 700 architectural sheets by Visentini that belonged to Smith: three volumes entitled Admiranda Urbis Venetae passed with the transfer of the King’s Library to the British Museum (now in the British Library), and a further volume, Admiranda Artis Architecturae Varia is still at Windsor (RCINs 910506-567). The present drawing belongs to a group of twenty-four loose sheets, each with black pen and ink borders, which were presumably intended to be bound up as a volume in the same manner. Many of the drawings are of buildings by Palladio but there are other important monuments such as the Rialto Bridge (RCIN 919291). These volumes of drawings comprised a comprehensive architectural survey in Smith’s library that asserted his credentials as a serious scholar of Palladianism. Many gentlemen visiting Smith at his palazzo were encouraged in these interests: the young Venetian Andrea Memmo wrote of ‘a great number of books on architecture which I was able to see in his house, and the guidance of Signor Antonio Visentini, made me pick out and prefer that style which is called pure and simple’. (Haskell, Patrons and Painters, New Haven and London 1980, p. 309).